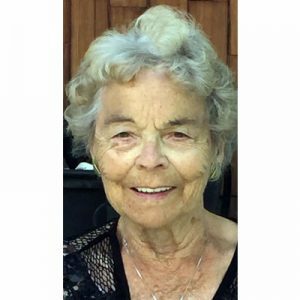 Jean passed away peacefully at home with family at her side on March 27, 2019 at the age of 96 years. She is survived by her children: twins – Kenneth Jacobs and Lillian Svensson, twins – Lucille Kiltau (Dave Laliberte) and Diane Macdonald, and Janice Russell; 15 grandchildren: Tina, Tara, Ken, Morgan, Yuki, Greg, Christine, Brent, Craig, Marc, Stacey, Devon, Kelly, Korey and Brendan; 23 great-grandchildren: Kayla, Adian, Alicia, Darci, Nicole, Ashton, Brooklyn, Sidney, Wil, Scarlet, Ashley, Chiron, Riana, Zoe, Benjamin, William, Avery, Dustin, Jordan, Cole, Mercedes, Dawson, Kayman, Charlie and Chase; and 5 great-great-grandchildren Axel, Tobias, Arlo, Adriana, and Griffyn. Jean is predeceased by her husband Dave, and 3 grandchildren: Chelsea, Kyle and Steve. Jean is the last surviving member of her family of 17 siblings, 12 of whom survived beyond birth. Jean loved to entertain and cook for her family and friends. She was renowned for her Bridge and Crib playing skills. She and Dave were Silver Medalists for Bridge one year in the BC Senior Olympic Games. Jean’s faith, energy, humour, strength, determination and love of family serves as an inspiration to anyone whose life she touched. A Funeral Service will be held on Friday, April 5, 2019 at 11:00 am at St. Charles Garnier Church, 3645 Benvoulin Road, Kelowna. Interment to follow at Kelowna Memorial Park Cemetery. In lieu of flowers, donations may be made to the Heart and Stroke Foundation, www.heartandstroke.ca. The service for RUSSELL, Jean is scheduled for Friday, April 5, 2019 at 11:00 am. Below you will find the map for the service location and the contact information should you have any questions. In the short time we have known Jean we have come to know her as a quick witted and fun lady. We really enjoyed the few times we spent together, at Dave and Lucille home mostly, and know she will be greatly missed by everyone she touched. Our love and wishes for happy memories go out to all her family. Aunt Jean was such a special lady and will be missed by everyone who knew her. I remember her visits – with Uncle Dave very fondly. Her cheery smile and chuckle. Her love of family and enjoyment playing cards. Rest in Peace Aunt Jean and give my Mom a hug when you see her. Rest in Peace to my godmother, loved you dearly and will always cherish the memories we have of you. Enjoy being in heaven with the rest of your siblings hi to all of them from us Im sure there is some celebrating going on with all of you being together again. Hugs to the family and friends remaining and someday we will all be together again as one big happy family. My sincere condolences on the loss of your mother. I know she will be missed by all. Sending condolences to your family. Aunty Jean was a special lady. So fortunate that she lived for 96 years.